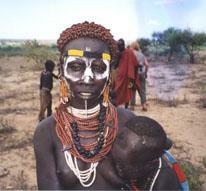 The Omo River is rated as one of the world's great rafting trips. It has it all: challenging whitewater, abundant wildlife, excellent birds, superb scenery, and some of the most unique unvisited people in Africa. It is a trip back in time, to another era, road-less and pristine, where wildlife and traditional tribal groups carry on their lives, relatively untouched by the modern world. The trip is for the adventurous in spirit, for the lover of the wild; the river expedition that in 15 years has not become a 'tour'. Whitewater: From the first hour of the trip, a series of lively and challenging rapids spice our descent. While offering splashing excitement, none of the rapids we encounter are threatening and no previous experience is required. We scout the larger rapids and team members will have the option to walk around, providing excellent photo opportunities. Scenery: The variety of scenery throughout the trip is truly dramatic; ranging from sections of spectacular sheer inner gorges (up to 4000 feet high) to lowland deserts. There are innumerable side streams with waterfalls up to 1000 feet high; water slides; hot springs; and clear, cool swimming pools. There are still many places yet to be explored and each trip we investigate new ones. The drive to the put in is 185 km through typical highland farming country, dotted with thatched huts among the fields of ripening grain. After riggin, we're off and soon baptized by the first of many rapids that abound in this section of the river. 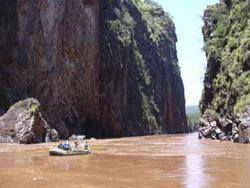 The river lies within a 1500 m deep canyon, and the scenery changes constantly. There's plenty of time for hikes and swimming in tributaries. we visit spectacular waterfalls, careen down the water slides of the Red Grotto and Baboon Flume, float beneath the 100 m cliffs of Serenity Canyon and soak in hot springs by the light of the moon. 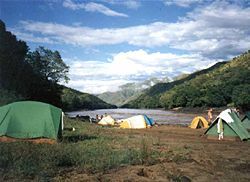 We usually layover (2 nights at one site) at least once, frequently at a lovely campsite from which we climb up to visit picturesque Wolayta villages. And the first half has an abundance of wildlife: hippos, crocs, antelopes, warthogs, monkeys, baboons, and sometimes lions. The drive back to Addis Ababa (for those doing the first half only) includes a night at beautiful Lake Langanno. The river continues in its deep canyon, but starts to mellow, with frequent tree lined stretches, and curves around enormous rock bars. But the rapids are by no means over: two of the Omo's most challenging await the third and fourth day. Superb vistas of distant peaks and mountain slopes patchworked with fields appear around every bend. 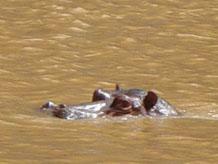 Birdlife density increases and hippo counts per day reach their maximum. 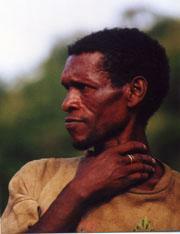 Hikes to highland farms bring us to more and more remote groups: Gemo, Gofa, Zala, Kulo Konta. Camps and tributaries continue to delight. 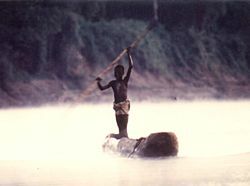 Finally, as the canyon opens up and the river broadens, we encounter our first group of lower Omo peoples, the Bodi, maybe skinning a just shot hippo, or cultivating sorghum on the banks. 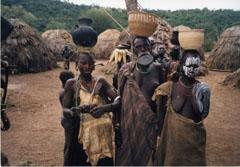 For the last 7 days or so, we encounter Mursi, Bode, Moors, Karo and Chug. Each group has its distinctive dress and decoration: fantastic hairdos, enormous clay lip plates, ear plugs, bark cloth and beaded leather skirts. There are many chances to buy and trade for carved wooden head rests, artful baskets, musical instruments, or honey. The trip ends near the confluence of the Mui River with the Omo, whence 4WD vehicles take us over the Mursi Hills, through Mago National Park, and up a very steep escarpment to Jinka, an entertainment frontier town with a lively market and a temperate climate. Here we enjoy fresh mangos, cold drinks, and a festive sit down dinner in a leafy enclosure. Next day it's back to Addis Ababa on an Ethiopian Airlines Twin Otter. Or we may choose to return by the very scenic road from Jinka.